Who needs a magic wand when you have an iPad? 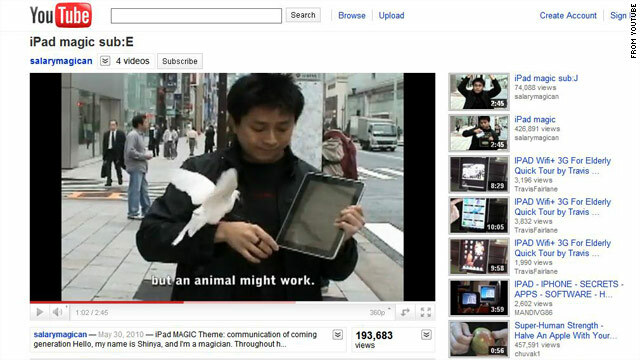 A magician makes a bird appear after showing a video of it on his iPad. (CNN) -- Sure David Copperfield can make the Statue of Liberty vanish in front of a live audience, but what can he do with an iPad? In a YouTube video posted by "salarymagician," Shinya -- who identifies himself as a magician at the beginning of the video -- incorporates the iPad in his sidewalk magic act, which just happens to take place in front of an Apple store. I'm not sure what's more impressive: How well he knows his way around an iPad, or how entertaining his magic tricks are. Different versions of the YouTube video have already been viewed more than 700,000 times. It doesn't really matter that many of Shinya's tricks probably wouldn't be possible without long sleeves and quick hands -- at one point he takes too long to pull a piece of cheese out of his sleeve. He redeems himself twice over when he makes a live dove appear in his hand moments after showing a video of it on the iPad screen. Another highpoint of Shinya's act is when he pretends to pour a glass of milk onto his iPad. Despite the fact that the contents of the glass are clearly staying put, it appears as though the milk has filled the virtual glass on the screen. Is this really magic? Probably not, but it looks pretty darn cool. Another cool, yet subtle, part of the video is when Shinya covers his face with the iPad. His moving face appears on the screen, but he's wearing glasses. When he removes the iPad, the same glasses are on his face. We should have seen this coming. Apple CEO Steve Jobs deemed the iPad "a truly magical and revolutionary product" when he unveiled the tablet-style computer in January.